I am so excited to announce that my new eCourse will be launching this January!! 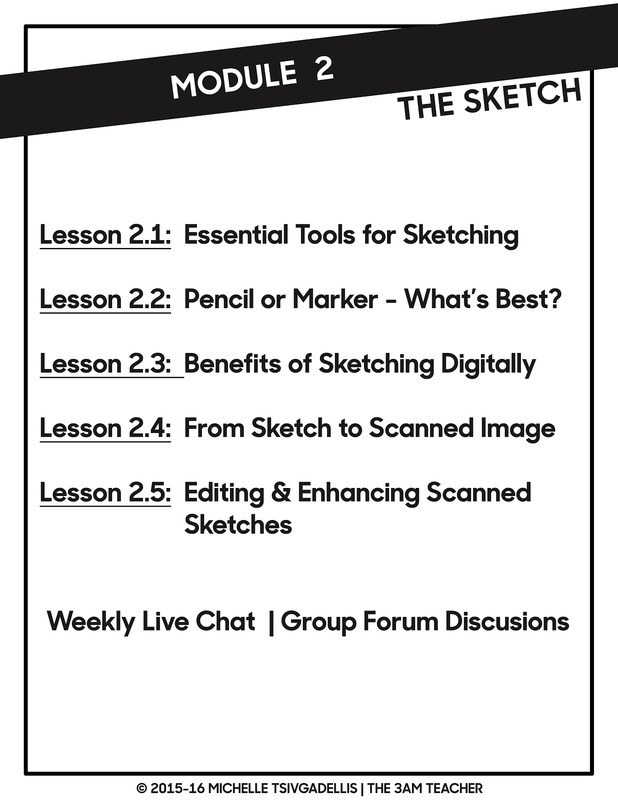 If you know how to doodle and have wanted to learn how to turn your own drawings into digital clip art you can use or sell, then this course is definitely for you! Clip Art 101: From Start to Finish is a self-paced, online course that will help you bring your own ideas and artwork to life. 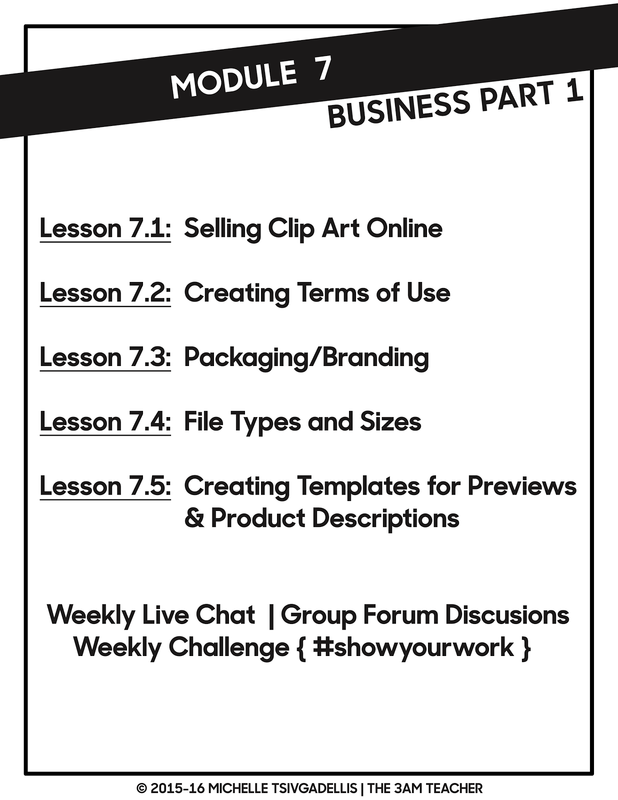 I’m going to teach you what tools and programs to use, how to create digital clip art from your own sketches, and how to start a business selling clip art online. I will show you my unique process for creating clean lines with high resolution and how to use Adobe Photoshop as if you were painting on paper or canvas using my painting techniques. This course is separated into 8 main modules or weeks of content, each with 5 to 6 individual lessons. Each Module (or week) includes printable lessons, videos, resources, exercises, and weekly challenges to show off your work and talk about what you learned. 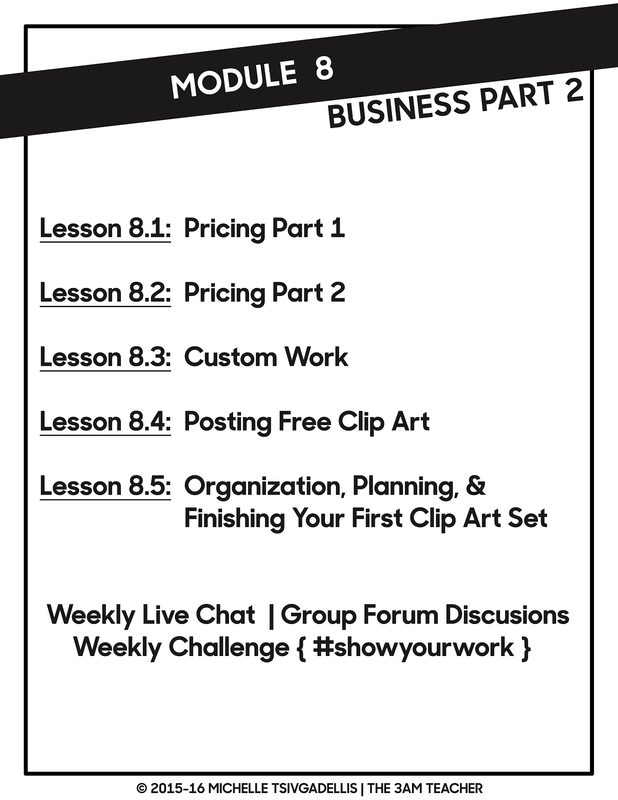 I will have a private Facebook group and online forum for those taking this course in order to ask questions, share work, and connect with other members. You will learn new techniques through each module and continue to grow as an artist! I would love to get 1000 people signed up and ready to get started before October. I am looking forward to starting the group forum and private Facebook Group early for those who sign up before October. Early birds will get an exclusive look into the process of putting these videos together and will get sneak peeks into much of the content before it goes live in January. 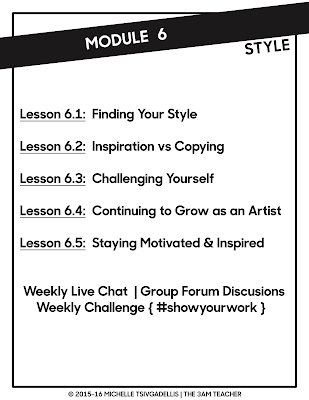 See the images below for sample modules and lessons that will be included. Learn the very basics of what you need in order to create high quality digital clip art. I will give you an in-depth look into the tablets and graphic display monitors that I use and why I chose to use them. We will also look at alternatives that are comparable for those on a tight budget. You will learn the Photoshop interface and how to customize it for creating clip art. 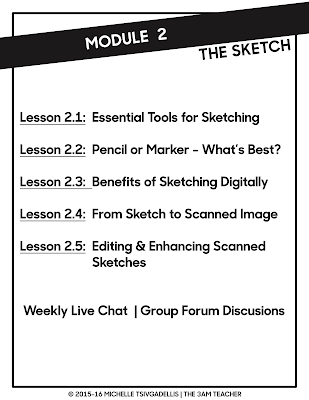 Learn how to improve your sketches so that you save time transforming your original drawing into a digital clip art image. 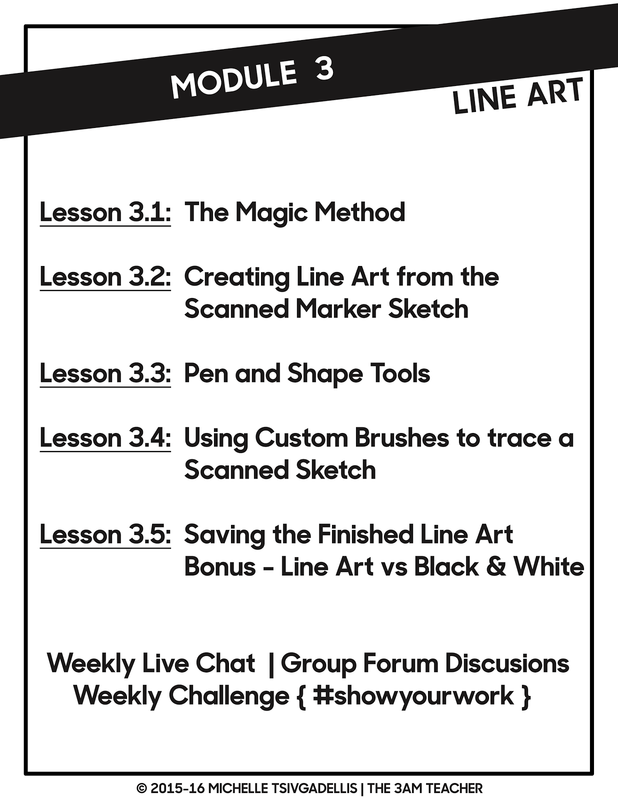 You will also learn the simplest ways of scanning your original art and enhancing those scanned images to improve the quality of your finished line art. I am all about teaching you techniques to help save time. 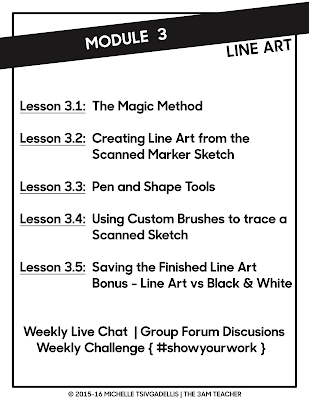 Learn my unique processes of transforming pencil sketches, marker sketches, or even digital sketches into clean and smooth line art. If you plan to enlarge your images or format them for web design, then making sure your line art is clean is absolutely a must. 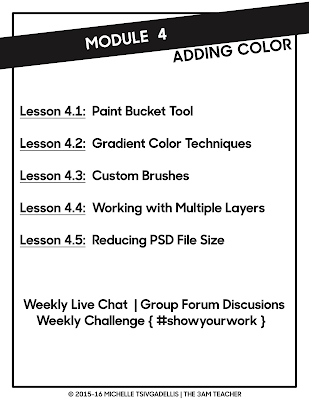 Learn the basic of adding color using the standard tools in Photoshop. You do not need to be a painter or skilled artist to drop some color into your images, however, you do need to know how to effectively choose your colors and improve the look of even the most basic images. 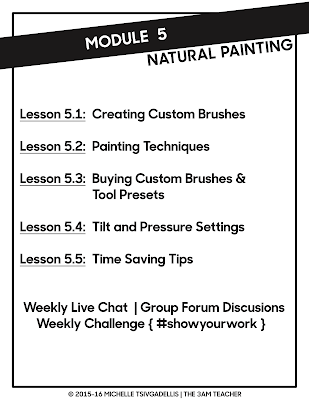 Learn to create and use custom brushes to give your finished art a realistic painted look. 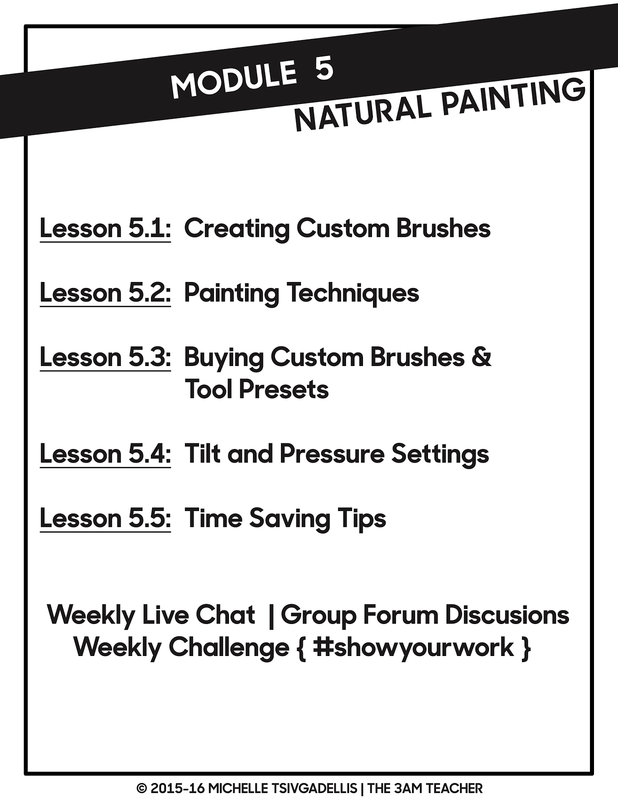 I will teach you some of my techniques and provide you with a set of my favorite custom made brushes for you to practice with. For those using a Wacom Companion or Graphic Display monitor, I will show you how to get an even more realistic finish on your art by using the advanced settings and custom tool presets instead of custom brushes. 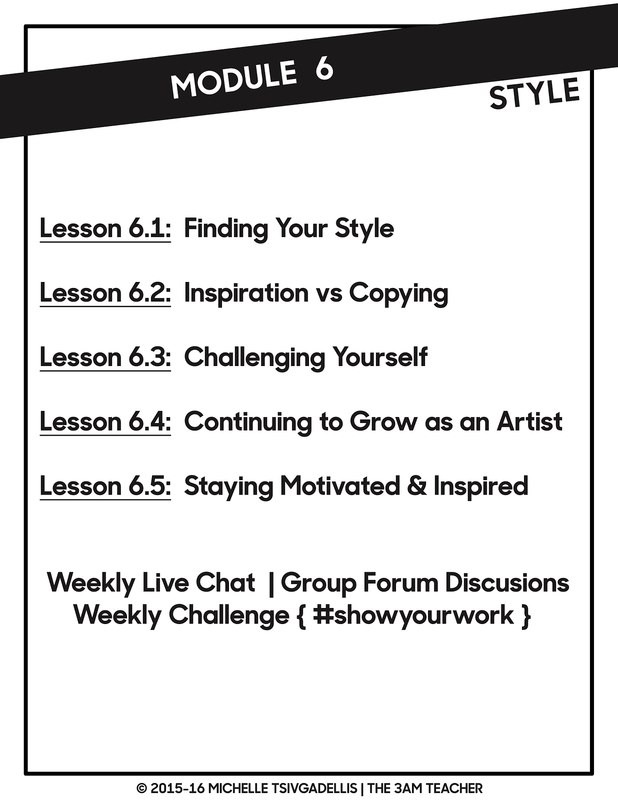 Learn how to find your own unique style and how to continue to grow and challenge yourself as a digital artist. As most of you already know, I love to mentor new artists and I really love to teach. This is a way for me to mentor, teach, and a chance to share my knowledge. I can't wait to get started and watch all of you grow - because there is no better reward than to help others achieve their goals and watch them blossom. Please help me to spread the word and get as many people signed up. Download my FREE course overview HERE. The complete course will be available on January 15th, 2016. Pre-order before October 31st, 2015 and save $75 on the complete program. Click the image below to sign up now. I look forward to getting to know all of you and I hope you are all as excited as I am for this new adventure!! I am hoping to sign up soon. 250$ is just a big investment. Will this cover gimpshop or other free alternatives for creating clipart before investing in Photoshop? Hi Michelle! I will not be covering Gimp - as it is not something I use or recommend using for good quality images, however, I will be covering a section on some free alternatives that I do recommend. One is actually pretty darn close to Photoshop and is completely free to use. I wouldn't recommend anything free for long term use, but definitely worth using when you're just getting started. I have a handful of good recommendations that will be featured in throughout the course. I would love to have you join the group! I sent you an e-mail, but figured I'd ask here too. 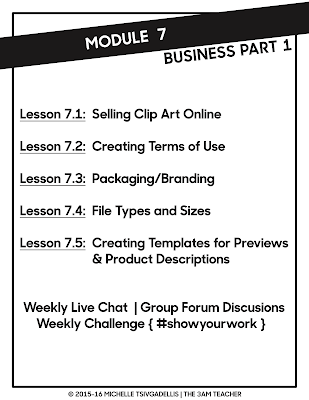 I am very interested in the Clip Art 101 class that you are offering. I sounds like fun. I like to draw, but don't yet have the technical know how that goes along with it. I am hoping that your course would help with that! I have a few questions if you don't mind answering them before I invest the $250. I do not currently have Photoshop. The best I have now is an Art Galley app on my iPad. :) About how much would the Photoshop investment cost? How do I purchase this? Is it hard to install? Can it be installed on multiple computers? Do I need a desktop computer to really work with this? I have both a desktop and a laptop now, but the desktop is a bit outdated. I assume a scanner is a must?? Does Photoshop charge a monthly fee? You mentioned painting...I'd like to make some basic clip art at first of course. Perhaps just borders, frames, etc. Will you be covering things like that? Eeek - lots of questions!! Thank you for any advice. Hello! 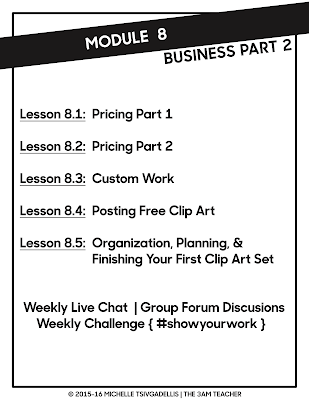 I love the idea of your Clip Art class. 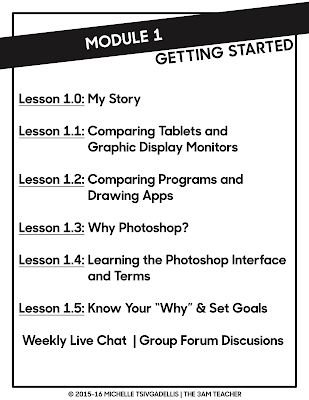 If I don't have Photoshop will this still be a useful class to take? Is there a difference between Photoshop and Illustrator with regard to cost and what can be done with each one artistically? Having never used either, I am not sure what to do. Thank you in advance for some insight. I'd love to sign up before tomorrow if I know that I can make good use of the knowledge. Hi Michelle! I am a TPT seller, but have been interested in diving into the world of clip art for a while now. What tools/products would be needed in order to participate in this course? Thanks! Hi Erin! Thank you so much for your interest. 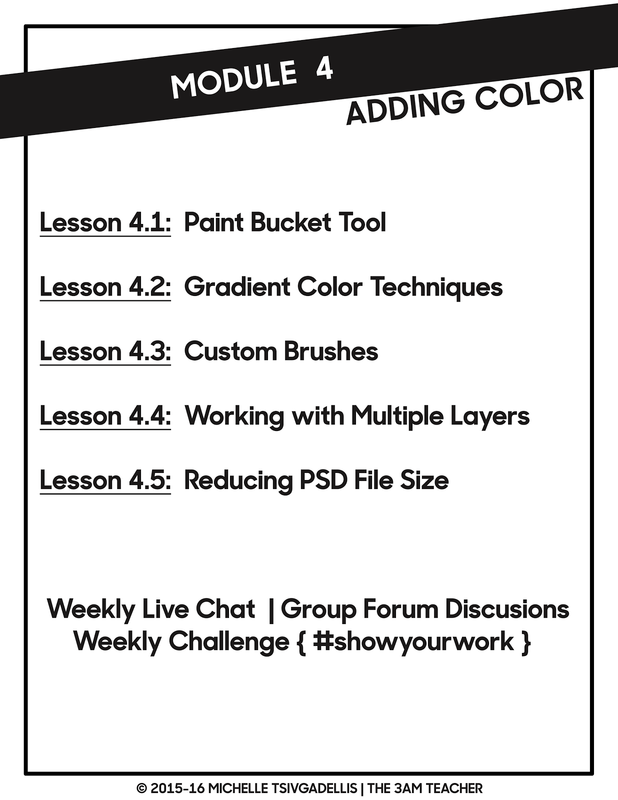 I will be going over various programs and tools that can be used in the first week on the videos, however, I do recommend that you have a tablet and stylus as well as Photoshop CS5 or higher. 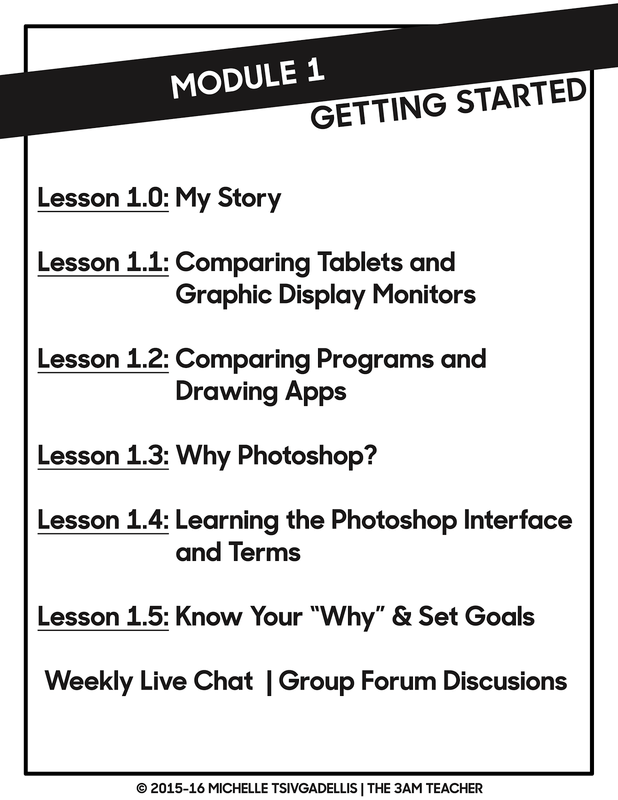 You can use your mouse and sign up for a 30 day trial of Photoshop once the class begins, but a mouse will be far more difficult to use for drawing digitally. Feel free to email me and I hope to see you signed up to take the course. Amazing blog shared here. One can also check the details of free online gate test series at Online ICE GATE Institute. Hi, Is the class still available? It the content drip? Do I need to get my hands on photoshop? clip art (also clipart, clip-art), in the graphic arts, is pre-made images used to illustrate any medium. Today, clip art is used extensively in both personal and commercial projects, ranging from home-printed greeting cards to commercial candles. see more extensive clip art collection on Ourclipart. Such as bsa clip art lawyer pictures clip art research clipart friendly clipart jail bars clipart maltese cross clipart alpaca clipart.